The KTM 1090 Adventure R is an exciting machine to ride with its liquid-cooled v-twin power plant generating 125 horsepower. It also features incredible WP suspension including a PDS rear-shock, confidence inspiring traction control modes and best-in-class ABS that performs well both on and off-road. The team at RideBDR along with Touratech have taken this great ADV machine and made it even better with some nice additions. 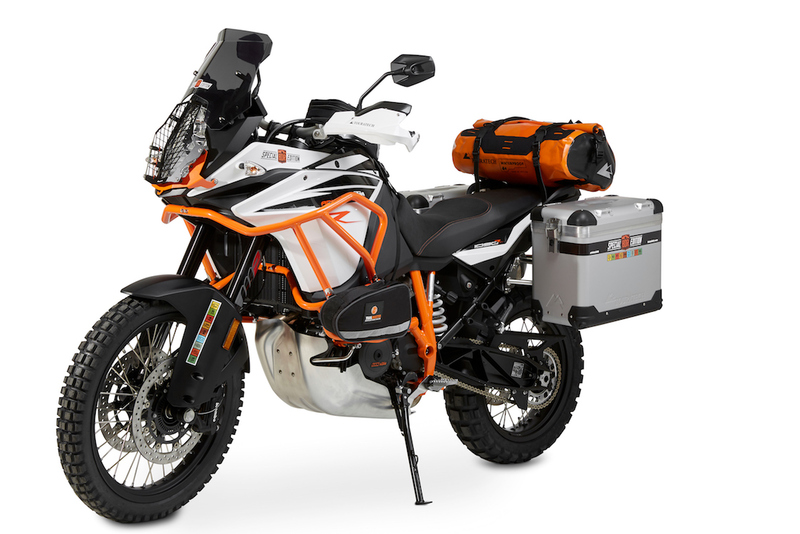 No adventure motorcycle is ready to explore without luggage. There is really only one luggage system that is universally known as the industry standard and that is the Zega Pro Pannier System. 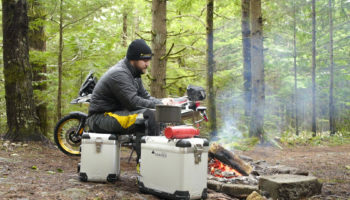 Waterproof, dustproof, lockable and easy to access, these hard cases are the “go to” boxes for world motorcycle explorers like Helge Pedersen and Simon and Lisa Thomas. The keep your gear protected, your bike protected and can be the only thing between your leg and ground in a fall. The Zega Pro system on the BDR Special Edition has one of a kind graphics! 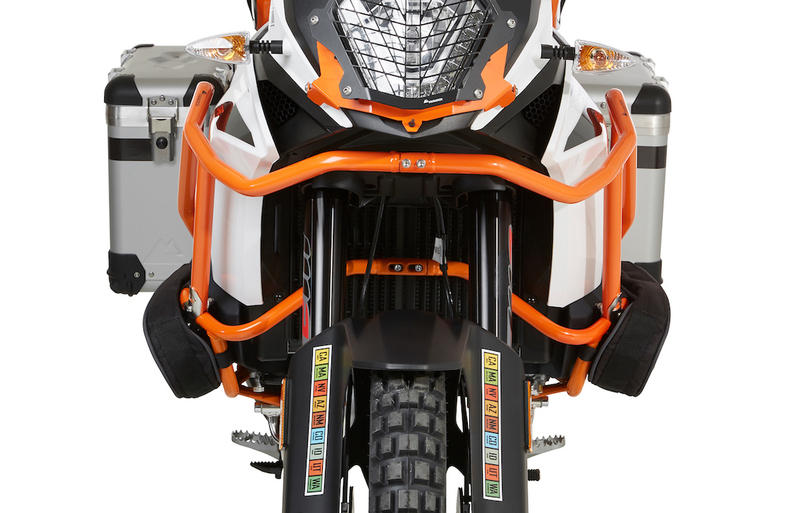 These Touratech GD Hand Guards for the KTM 990 and 950 Adventure are strong, lightweight, and look great on the motorcycle. Made of tough, impact resistant plastic, the Touratech handguards will protect the controls and handlebars of your KTM, as well as your hands from brush. These guards are plenty strong to take an impact during a fall, but flexible enough not to transmit too much force into your bars and break any components. Through countless hours of on-bike testing, the designers at Touratech created a great rally-inspired windscreen that provides plenty of coverage, but won’t get in the way when you’re riding off-road. Thanks to their sharply angled upper edges, these windscreens kick the wind upward more than a conventional shield and give you more wind coverage with a shorter screen. Putting it on our BDR Special Edition was a no-brainer. Choose between a clear shield for ultimate visibilty, or the tinted version for a more stealthy look for your KTM. The two available sizes let you decide just how much wind you put in your hair. This manufacturing process also completely eliminates the need for welds, a common location for cracks to begin. Designed with smooth radius bends, the shell is a much stronger structure than other skid plates on the market. Beyond strength, there are more benefits. 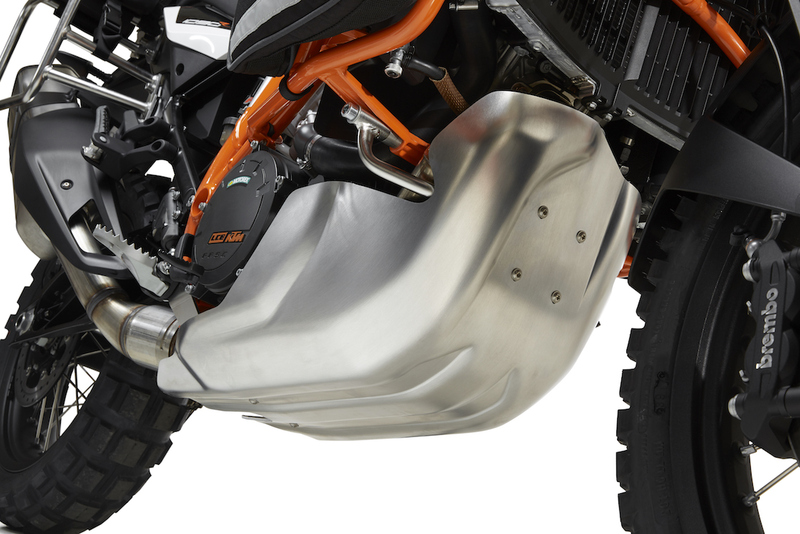 With no sharp-corners to snag or get hung up on obstacles, the Rallye Form skid plate will glide over deep sand or rough terrain making a smooth experience both bike and rider and it looks awesome too! Made of stout 25mm (1″) diameter stainless steel tubing, then powder-coated in matching KTM Orange or Black, these crash bars are the perfect compliment to the exisitng KTM 1190 or 1090 bars. Mounted with a heavy-duty clamp system, the bars create a strong bond to the lower crash bars, evenly distributing the force of the hardest drops off-road. The strong front cross-brace connection is engineered to transmit force in case of a crash, minimizing damage to your KTM. The Adventure dry bag is available in three different sizes, and seven different colors to meet every need and preference. Obviously, our KTM Special Edition called for orange and we went with 31L. Bright 3M reflective details add much needed visibility to the back of the motorcycle when riding at night or in foul weather. The full-length roll-down closure makes the dry bag a breeze to pack and un-pack, and the compression straps allow you to mimize its packed size. 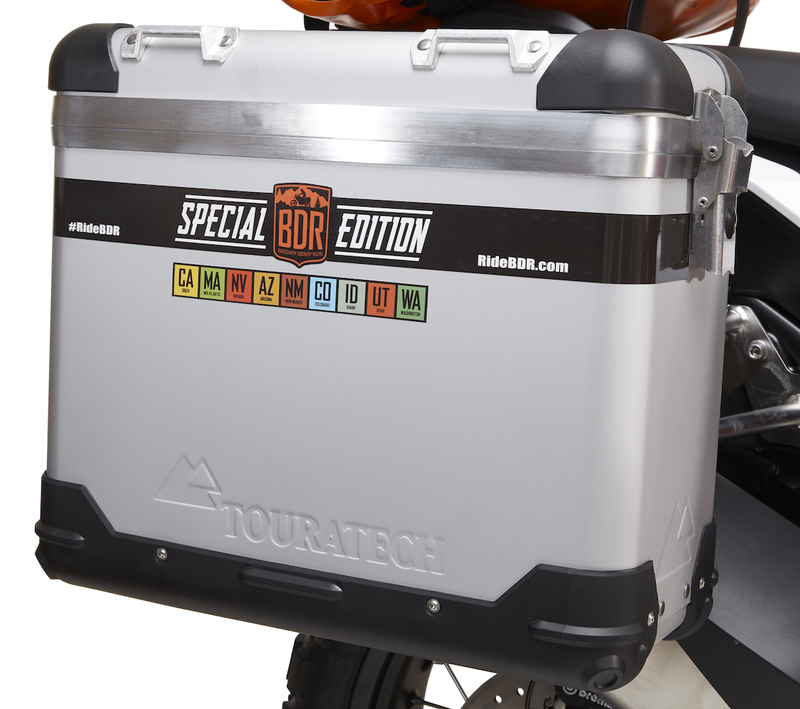 Touratech also added one of our off-road tank bags to maximize load capacity! If you’re interested in getting your hands on this one-of-a-kind adventure riders dream bike, it’s up for grabs through the Backcountry Discovery Routes fundraising auction. Just CLICK HERE TO ENTER!